In a nervous cell, different ions (sodium, potassium, chloride, etc.) have different concentrations on each side of the cell membrane. But, as we saw in the previous section, ions tend to diffuse rapidly around the solutions which makes the inner and outer environments of cells, and gradually become balanced, that is, their concentration becomes the same in all parts of the solution. The first cause is temperature. When ions and molecules dissolve in a solution, they move randomly about (thermal agitation or Brownian movement), and thus travel to other parts of the compartment. The speed of this movement is dependent on the temperature, i.e. ; the higher the temperature of the solution, the quicker it will reach equilibrium. The second cause is the the difference of concentration or chemical gradient: ions from regions of higher concentration move toward regions of lower concentration. The third cause is the difference of electrical charge or electrical gradient. Positive ions (cations) are electrically repelled away of parts of the solution which is positively charged and attracted to parts of the solution which are negatively charged. Negative ions (anions) are influenced in the same way: repelled by the same charge and attracted to the opposite charge. allows the water and molecules to move freely (diffusion) to the other side. The speed of diffusion is proportional to the temperature of the solution. Now, biological membranes, such as the cell membrane. are permeable to many ions. This is so because of the existence of pores or passive transport channels bridging one side to the other, through which ions can pass freely. For instance, if in the compartment on one side of the membrane there is a higher concentration of common salt (made of sodium and chloride ions) than in the other side, these ions will pass gradually to the other side, following the difference of concentration. Eventually, both compartments will have the same concentration of ions. 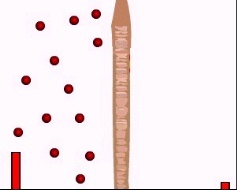 The rate of passage is regulated by the number and size of pores (it is not an instant phenomenon, because it is a kind of slower diffusion). Small pores in the surface of the permeable membrane allow the selective passage of ions. There are specific channels for each ion (sodium, chloride, potassium, etc.). The rate of passage is regulated by the number and size of pores. After a while, the concentration of both ions (green and yellow bars) will be the same on both sides of the membrane.